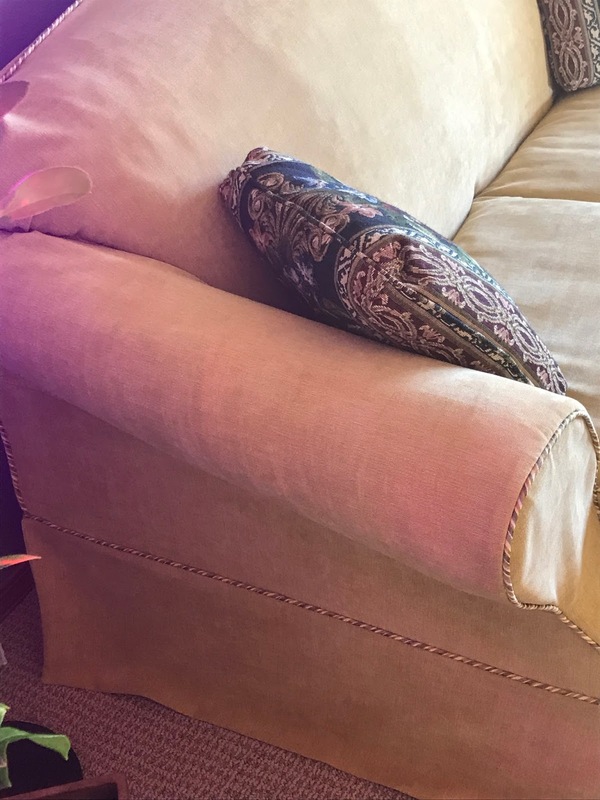 Making a fitted slipcover for my wonderful couch that is still in awesome shape was extremely challenging for me, but as of last night, I am officially finished with everything except the narrow hem for the back which will need to wait until my hands recover. I'm very proud to have it finished. The pillows you see is what the couch looks like underneath her covering. We were sick to death of the pattern and color, but having the pillows as an accent isn't bad. I'll live with it for a bit before deciding whether to recover them as well. If I were to do it again and not to distant in the future, I'm sure it would be much easier having had the first one to get the hiccups ironed out. My Bernina was a trouper and didn't balk at me until the end when the layers of material got very excessive. It was slow going one stitch at a time, but I made it. I understand why upholstery professionals own commercial walking foot machines. I'm pretty proud of how the sides came out. In order to get the cover to be fitted, I added a length of velcro on the seam line underneath the arm and my sweet husband was kind enough to add the sticky side of the velcro to the couch using a staple gun. It worked perfectly! Prior to doing that, the fabric from the bottom part of the outside arm wanted to hang out from the body of the couch a bit. It wasn't bad looking at all. I just like a more tailored appearance. My other project was a fun one -- Kitchen Towels! I've made two so far and have plans for several others. And so you, too, can join in on the fun, I am attaching the link to my local craft store that is giving away the instructions and pattern for free! Click HERE! I'd love to see your versions of the kitchen towel if you make one/many! Waiting for a customer order to arrive but for now I think I will add a few more rows to my rug in progress. Wow, JoJo, I am so impressed with your slip cover!! Great job!! And your little dress kitchen towels are darling!! JOJo, my mom did upholstery for 40 years. I greatly admire you tackling that job. I can't tell you how many times I've been asked if I make slip Overs! NO, no and more NO! Hehe. The couch looks great. Beautiful slip cover. . .I look forward to seeing it in person! Those kitchen towels rock!